Perbanas Institute hosted an international journal writing workshop with Universiti Utara Malaysia (UUM) from 15th – 18th December 2015 in keeping with its aim of achieving ambitious targets laid out in its roadmap titled ‘Vision 2019’. 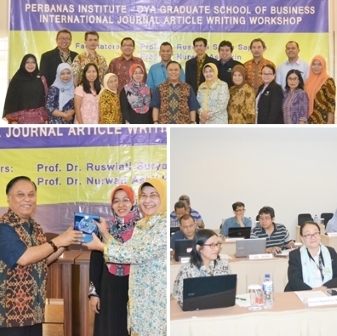 The two-part workshop, held at Hotel Santika Cirebon and Griya Perbanas Jakarta, was focused on sharpening the writing capabilities of Perbanas Institute’s faculty members to facilitate greater success in having their research published in international journals. Attendees at the event included UUM’s senior staff members namely Prof. Ruswiyati Surya Saputra and Associate Prof. Dr. Nurwati Ashikin Ahmad Zaluki as guest facilitators in addition to a number of senior lecturers from Perbanas’ Faculty of Economics and Business, Faculty of Information Technology, and the Perbanas Postgraduate School. As highly experienced academics that have enjoyed success in contributing to international journals such as Scopus, UUM’s Prof. Ruswiyati Surya Saputra and Associate Prof. Dr. Nurwati Ashikin Ahmad Zaluki’s sought to provide Perbanas’ participants with the tools to significantly improve upon their writing skills – an aspect of research publication that is often overlooked. The workshop therefore involved lessons on writing methodologies, referencing and a guide to citations, as well as covered other topics on technical skills needed to meet the standards expected by international journals. This latest workshop event with Universiti Utara Malaysia is demonstrative of Perbanas Institute’s continued measures to improve upon the quality of its human resources and strengthen its position as a leading player in Indonesia’s higher education industry.